Gangnapur (Nadia): An explosion at a fireworks manufacturing unit in Nadia's Gangnapur on Sunday killed the factory's owner and a relative. 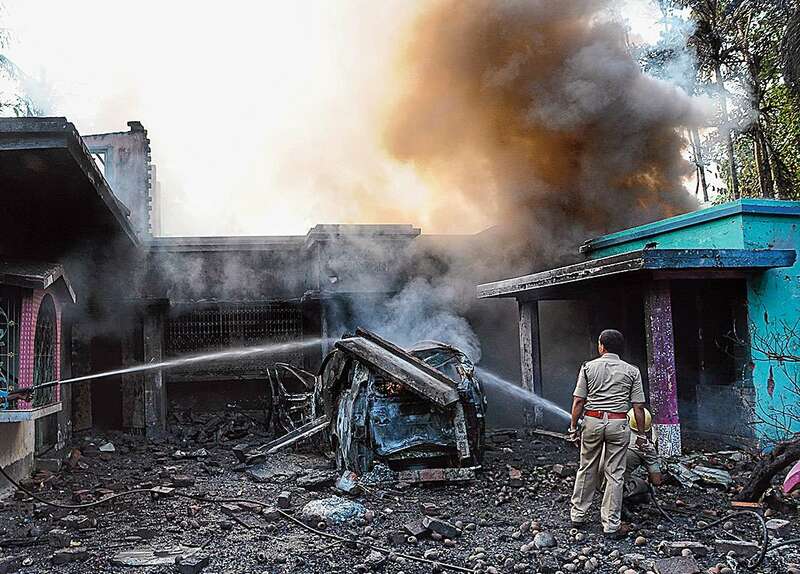 Three persons were injured in the inferno at the factory housed in a one-storey house, which was gutted along with a car and at least three other homes in the area dotted with cracker units. Police - the blast took place barely 100 metres from the Gangnapur police station - have not specified what triggered the explosion. Some residents suspected a leaking LPG cylinder in one of the houses. Fire officials pointed to the nitre, sulphur and charcoal - ingredients of gunpowder - stored for making fireworks and said the stockpiles had fuelled the explosion and caused the fire to spread fast. Mithu Mandal, 45, owner of the Pampa Fireworks factory and relative Ranjit Biswas, 49, were inside the unit when the blast occurred and died on the spot. The unit had a licence for fireworks, a police officer said. Tapas Das, a resident, was around 50 metres away. "I lost my balance and fell on the ground," he said. Four fire tenders were battling the blaze till late on Sunday evening. Nadia police chief Rupesh Kumar said all units' licences would be checked. An explosion at a fireworks manufacturing unit in Nadia's Gangnapur on Sunday killed the factory's owner and a relative.